About a month ago, Brooke and Hannah (the two girls in the middle of the top row), friends of Summer’s from Riverwood High School, called Team Summer to say that they were planning a Team Summer fundraiser to commemorate the one-year anniversary of Summer’s passing. On their own, they found someone to make Team Summer bumper stickers….for free!….and got their principal’s permission to sell them at school! Then, on Monday, November 11th, and the day after, with the help of more of Summer’s friends, the girls sold the stickers during every lunch period. 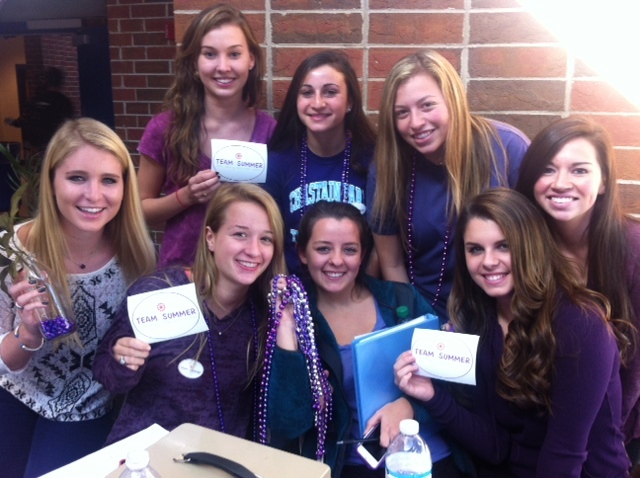 They even coordinated for everyone at school to wear purple – Summer’s favorite color – on November 11th! In just two days, the girls raised a whopping $933!! It’s $5 for the big sticker and $3 for the smaller one. Add $1.50 for the envelope and postage, and the girls will mail you your order! A HUGE thank you to Leslie Weatherly at Team Banner for contributing the stickers! We are so impressed with the girls’ ingenuity and follow-through. No doubt, Summer would have been impressed, especially since the girls even got permission to skip some classes! Thank you so much, Brooke and Hannah, and everyone else who helped! In the true spirit of Team Summer, you made what could have been a really tough day, one that was instead full of love and giving.